rocky's bru: Sabahans don't want secession; we just don't get it! Sabahans don't want secession; we just don't get it! 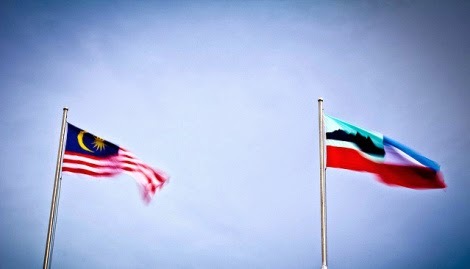 Updated: The blogger Zakhir Mohd says the conspirators for the so-called Sabah secession are from outside the State. He named some of them in his latest posting Semenanjung luficers instigating Sabah secession. "This is the perfect time for the Sedition Act to be used against (them) …" he writes. I am not a fan of the Sedition Act but I can imagine that the majority of Malaysians will appreciate the wisdom of the government if it uses the Act judiciously and on anarchists, not on the likes of Azmi Sharom, whose appeal had always been niche (until he was charged with sedition, that is). "We are NOT trying to scare the people ...."
KOTA KINABALU, Sept 21 ― Sabah will be vulnerable to possible terrorist attacks from Southern Philippine’s Islamic rebels without the protection of security forces from the federal government, Datuk Seri Hishammuddin Hussein warned today, warding off calls for the state to leave Malaysia. The Defence Minister warned pro-secessionist groups that the threat of a terrorist takeover was very real in light of a recent statement from Southern Philippines’s Bangsamoro Islamic Freedom Fighters (BIFF) and the Abu Sayyaf, who have pledged support for the Islamic State (IS) militant movement. “We are not trying to scare the people but we want to remind them (pro-secessionist groups) not to gamble with Sabah’s future. “The terrorists have made it clear of their intentions of creating an Islamic State in the region,” he said, reminding Sabahans that security personnel in the Sabah now comes from the federal government’s Defence and Home Ministry. Listen to the Sabahans: Foreign Minister Anifah Aman speaks while Hisham listens. What Hisham should do is leave it to the Sabahans to speak on behalf of Sabah regarding the secession talk. Because if you understand the sentiments on the ground, you'd understand that Sabahans DO NOT wish for secession. They want a better deal from the Federal Government and they have not been getting it (and they and we know that) despite Najib Razak's gesture of putting more Sabahans in his Cabinet after the last general election. Read also: Scottish nationalists in tears after countrymen and women voted against "independence"
There you nailed it... Hopefully the UMNO leadership can think better instead of just giving threatening scenarios. Jeeez... when would they grow up. What better deal? Is Terengganu, Pahang, Kedah and the States with abundant amount of natural resources getting better deal from Federal Government? Sabah got pretty much an autonomy over most things. Their own immigration system, their own police commissioner, their own Federal court, autonomy over their own Ministries, not tied to Federal agencies, no contractor and supplier can participate in state government tender unless they are from Sabah. What better deal are they talking about? Every state contribute to the Federal government. No other states from Peninsular getting preferential treatment from Federal government. If Sabahan feel short-handed, they should query their state government, not the semenanjung people. With this kind of attitude, Sabah won't get anywhere even if they change government a million times. "The blogger Zakhir Mohd says the conspirators for the so-called Sabah secession are from outside the State.."
You guys still don't get it aren't you? Why it is only now they're talking about secession? After all these years, why now? After 49 years of living peacefully together, all of a sudden, these guys talking about mistreatments, discriminatory policies and agitating for breaking up. The truth is folks, right after last year GEs, those guys found out Sabah and Sarawak were the main reason BN still standing and able to continue ruling. So they need to find ways to penetrate BN fortresses after strategies accusing the native leaders of corruptions failed miserably. Since then, various NGOs formed agitating for secessions citing mistreatments and disregards; to make the people of north Borneo states feel angry and give their supports to them. When these movements become big and threatening the national security, I'm afraid it'll be wee bit too late to act. Read the Malaysian agreement 1963 between negara Sabah, negara Sarawak and Malaya before you make your ignorant comment. Looks like you're the one who's ignorant. 100% of what I said were covered in the 20 points agreement of 1963. do take note point 7 specifically said Sabah Sarawak got no right to seceed.